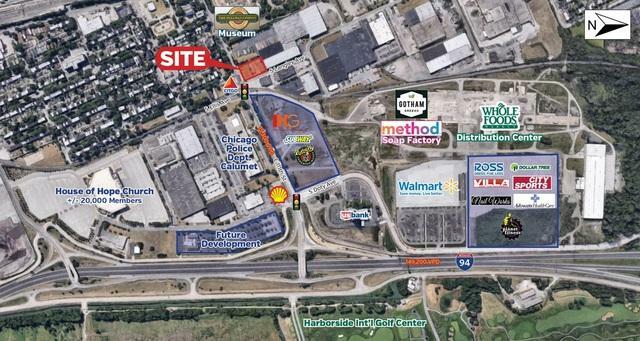 11042-46 S. Langley is a 42,647 SF parcel at the hard corner of 111th & Langley (NWC) in Chicago, IL. It is located in the historic Pullman neighborhood which has seen a rebirth in recent years. A new Whole Foods Distribution Center is being built immediately East to go along with the existing Method Soap Factory, Gotham Greens, U.S. Bank, Chicago Police Department and Wal-Mart Shopping Center. A full interchange exists at 111th & Interstate 94, 0.4 miles to the East. The site measures approx. 176.85' x 241.15', has multiple curb cuts and is zoned M3-3. Contact Broker for further details.